Summer at the ranch means the flowers are blooming throughout the area’s valleys and peaks. Majestic views from the cabins and the neighboring Grand Teton and Yellowstone National Parks are brushed with shades of red, yellow and blue splendor. An abundance of wildflowers can be found along our streams, in mountain meadows and from the trails. The growing season, however, is short with only about 60 continuous frost-free days a year. Nature makes up for this brevity with a proliferation of flora. Flowers bloom between May and September, with June and July providing the best of the floral displays. Dominant blooming flowers change quickly from week to week. 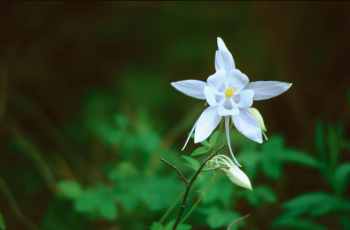 The peak wildflower period typically occurs from early to mid-July. In high mountain elevations the peak blooms occur in August. Here are some of the flowers you can expect to see during your summer visit and where you’re likely to find them. The state flower of W yoming grows on rocky slopes, amidst sagebrush and in open areas throughout Wyoming. This red or crimson flower grows low to the ground and can be found throughout summer. 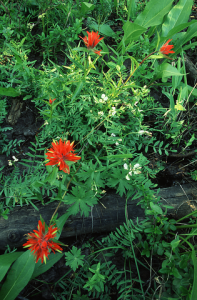 Our area also boasts white, yellow and scarlet colored Rocky Mountain Paintbrush and, if you’re lucky, you just may find a few along the trails and cool canyons in July. The flower is often abundant in open fields, pastures and in recent burn areas. This conical flower is red or pink and can grow 3 to 4 feet high. Fireweed gets its name from its habit of quickly growing on forest fire burn sites. 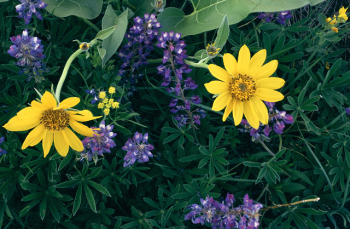 These bright, yellow flowers rise from plants with arrow-shaped leaves and grow in mountain fields, pine forests and throughout the sage flats. At the right time of summer, entire hillsides will appear painted in yellow with this friendly flower in peak bloom. The pattern of this beautiful blue to purple flower’s petals resembles a daisy, but the only similarity in color is found in its yellow center. These showy blue flowers can be found in forests, small tree stands and amongst other wildflowers in bloom on hillsides throughout Wyoming’s mountain landscape. Growing in moist grounds of mountain meadows and hillsides, often near streams or wet meadows, these tall blue flowers are also called Wolf’s Bane or Blue Rocket. Growing in the sage flats, pine stands or on a hillside, these blue flowers can grow to about 2 feet high. They are most often blue but can be close to purple and are vertical, pea pod in structure. 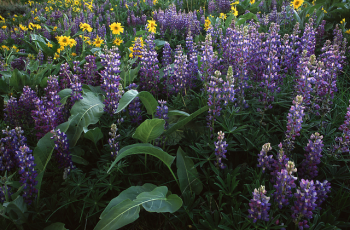 While lupine can be seen in June, the most plentiful displays are found in mid-July. These pink or rose-colored flowers are found at the top of plants that are 18 to 36 inches tall. They grow in the pine forests and mountainsides down to the valley floor. These famous, delicate flowers can be foun d in areas that offer shade or partial shade. Along a stream, underneath a lone tree or a moist area of the pine forest floor, you will find these beauties in white, yellow and shades of blue. Most often found on cliff faces, rocky outcroppings and open, dry areas, this tall blue bell-like flower can be found in late June to August. 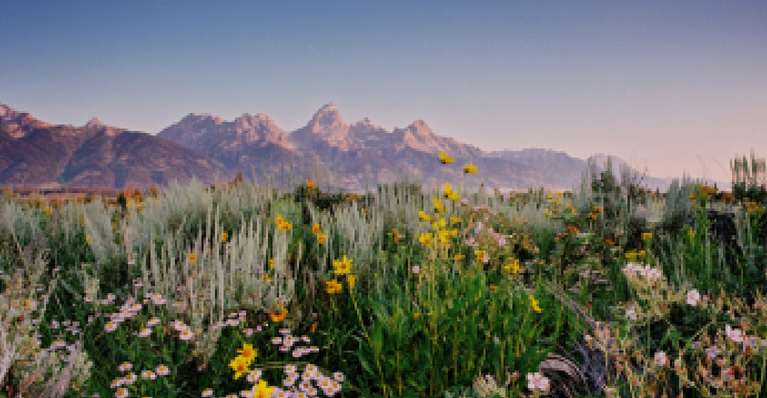 Whether you extend your stay to spend a day or two in Grand Teton National Park or have just enough time for a leisurely drive between the ranch and the Jackson Airport, you can see as many wildflowers as you want. Highways 26 and 191, between Turpin Meadows Road and Jackson. View wildflowers in the sage flats from the car or by stopping at any of the numerous pullouts. Moran Junction to Jackson Lake Lodge. Wildflowers are aplenty in the meadows along the Snake River. Oxbow Bend provides majestic views and beautiful flowers. Teton Park Road between Jackson Lake Lodge and Moose Junction. We highly recommend this inner park drive for amazing views, wildlife and trail access. We hope that your summer stay at the ranch gives you every chance to enjoy the beautiful flowers of our mountain landscape. We’re always here to answer any questions and help you plan your perfect summer getaway.